Evidences at Jebel el Lawz While at the mountain, Ron found the remains of a white marble structure which had been erected near the altar at the base of the mountain. These were the white columns that Ron saw on his first trip in 1984. The structure had been destroyed, but remnants of the columns were still lying around the area. 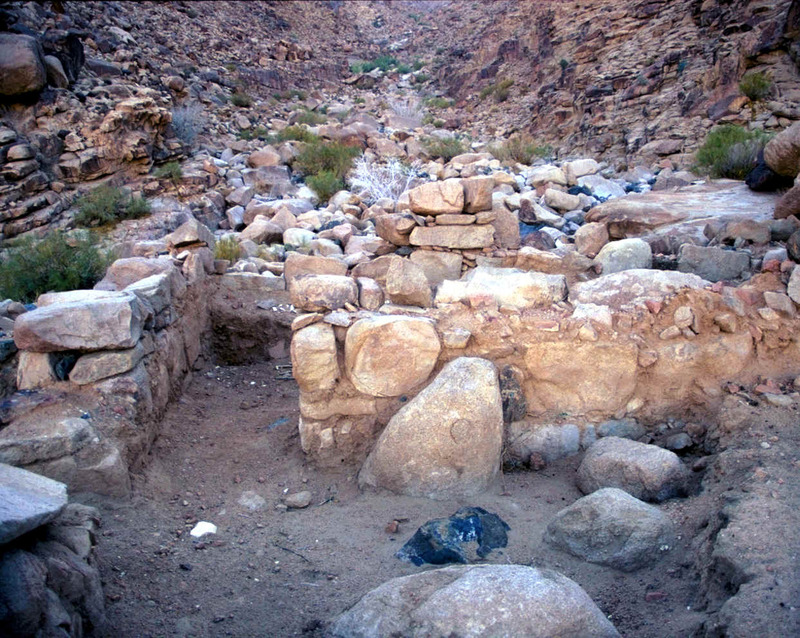 Ron was told by Bedouins in the area that the stone "shrine" had been dismantled and was used in a mosque in Hagl. picture of the "Holy Area" was taken. An altar of earth thou shalt make unto me, and shalt sacrifice thereon thy burnt offerings, and thy peace offerings, thy sheep, and thine oxen: in all places where I record my name I will come unto thee, and I will bless thee. 25 And if thou wilt make me an altar of stone, thou shalt not build it of hewn stone: for if thou lift up thy tool upon it, thou hast polluted it. 26 Neither shalt thou go up by steps unto mine altar, that thy nakedness be not discovered thereon. A portion of the "Large Altar"
We Found It! 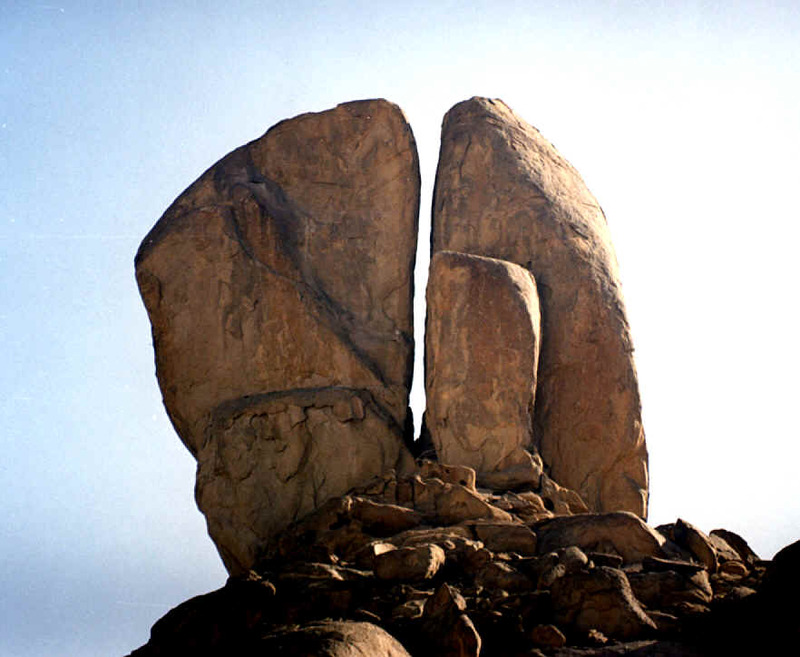 In 1984, after his imprisonment in Saudi, Ron had visited with Col. Jim Irwin at his office, and he had told Jim about both the "boat-shaped object" and Jebel el Lawz (Mount Sinai in Arabia). While Jim's main interest seemed to be in Noah's Ark exploration, he expressed interest in the site in Saudi and offered any help he could give. "Great news! We strongly feel that the REAL Mt. Sinai has been discovered. Since February, we have been searching in Egypt and Saudi Arabia in an attempt to find the real Mt. Sinai, currently believed to be in Egypt....Larry Williams and I [Bob Cornuke] have taken two trips to Saudi Arabia and traveled to Jebel al Lawz...."
Later, Larry Williams published his book called, "The Mountain of Moses" in which he documents how he and Bob Cornuke (Vice-President of "High Flight") sneaked into Saudi "discovering" the real Mt. Sinai. The saddest part for Ron Wyatt was that he had given the "High Flight" people directions to the site and even drawn a diagram of where everything was. We later learned that they went to Dave Fasold and got precise information which allowed them to "make their discovery". Yes, they found it: Right where Ron Wyatt discovered it 4 years before. "I have observed earlier that we could not possibly be at Mount Sinai. 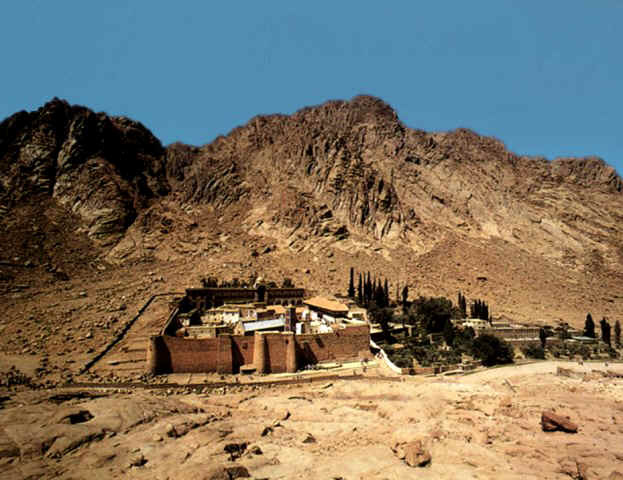 The monastery [of St. Catherine] was situated in a narrow valley, which was not even large enough for a medium-sized army to be able to camp in, let alone the 600,000 men that Moses had with him, who, together with their wives and children, must have come to over 3,000,000." The fact is clear that the Sinai Peninsula was always considered to be Egyptian territory. 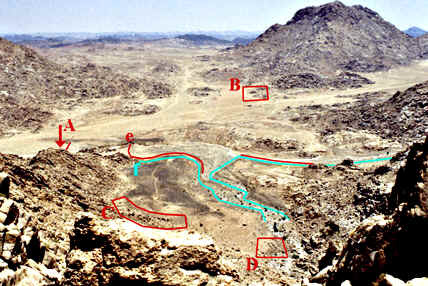 There is an abundance of evidence that the Egyptians controlled the Sinai Peninsula during the time of the Exodus because of their mining operations there. This archaeological evidence is still present and evident today. The peninsula today doesn't even have any population to speak of except those who live around the few oases, many of which today contain the gasoline stations for travelers. In "Arabia and the Bible" by James Montgomery, we read on p. 31: "...the land west of a line from the Wady of Egypt to the Elanitic Gulf [Gulf of Aqaba] has always belonged to the Egyptian political sphere, and actually that is the present boundary of Egypt....the South-Arabians called the same region Msr, i.e. Misraim, Egypt." Biblical description of Mt. 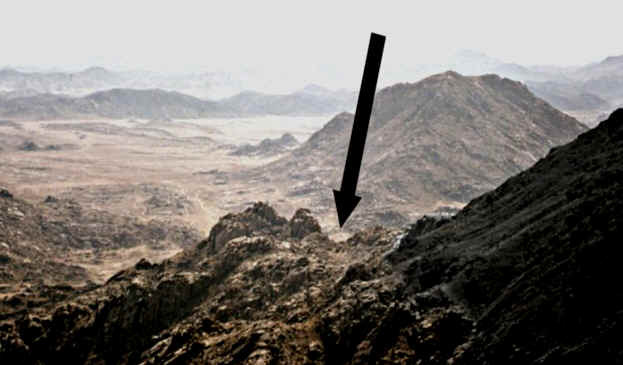 Sinai The first thing Ron noticed when he saw Jebel el Lawz in 1984, just prior to his arrest, was that the high peak of the mountain range was distinctly black. When one stands at the base of the mountain - just outside the boundary markers which we will discuss a little later, the high peak that can be seen looks like it is made of coal. The blackened peak of Mt. Sinai " And mount Sinai was altogether on a smoke, because the LORD descended upon it in fire"
" And mount Sinai was altogether on a smoke, because the LORD descended upon it in fire: and the smoke thereof ascended as the smoke of a furnace, and the whole mount quaked greatly...."
" And all the people saw the thunderings, and the lightnings, and the noise of the trumpet, and the mountain smoking: and when the people saw it, they removed, and stood afar off." " The mountains melted from before the LORD, even that Sinai from before the LORD God of Israel." " The earth shook, the heavens also dropped at the presence of God: even Sinai itself was moved at the presence of God, the God of Israel." Just over the western side of the mountain range, opposite the Holy Precinct, these is an area which features an incredible, five to six-story rock perched upon a hill that is about 200 feet high. This rock is split through the middle and displays the pattern of water erosion and evidence that numerous streams came forth in several directions. About 200 yards from this rock, is another altar constructed of stones. 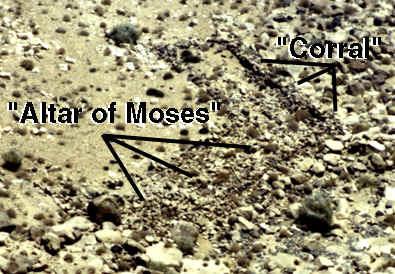 "And Moses built an altar....."
This area also features an immense plain area in which the battle with the Amalekites could have taken place. Twelve fountains of water, and threescore and ten palm trees; and they pitched there. 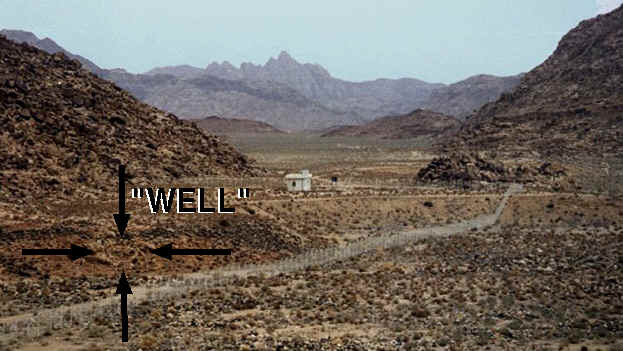 The top of one of the "Wells"
Recently, there are those who have claimed to have "discovered" Mount Sinai. The truth is that they discovered it exactly where Ron Wyatt did several years before they got there. Major "Christian" television networks have aired programs produced by their own production associates. Each time they do, we here at the Museum receive numerous telephone calls from angry people who recognize that the truth is not being presented. The network has been contacted as well as the producer of the programs. They are fully aware of the fact that Ron made the discovery years before, yet they refuse to make that fact plain. Truly, the love of money is the root of all evil. There is nothing that Wyatt Archaeological Research can do about this situation; but there is something that you can do. Turn that network off and tell others that they should do likewise.